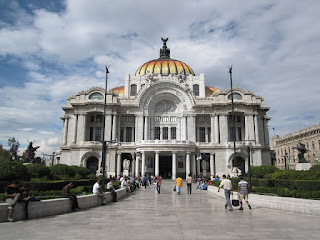 Palacio de Bellas Artes (Palace of Fine Arts): This building was intended for the 100-year celebration of the Mexican War of Independence in 1910. However, a civil war erupted in that year and construction stopped in 1913. Work was finally resumed in 1932 and completed in 1934. The original architect was Adamo Boari. His design is similar to the French classical variant of Art Nouveau introduced at the Universal Exposition of 1900 in Paris. The work completed in the 1930s is in Art Deco. 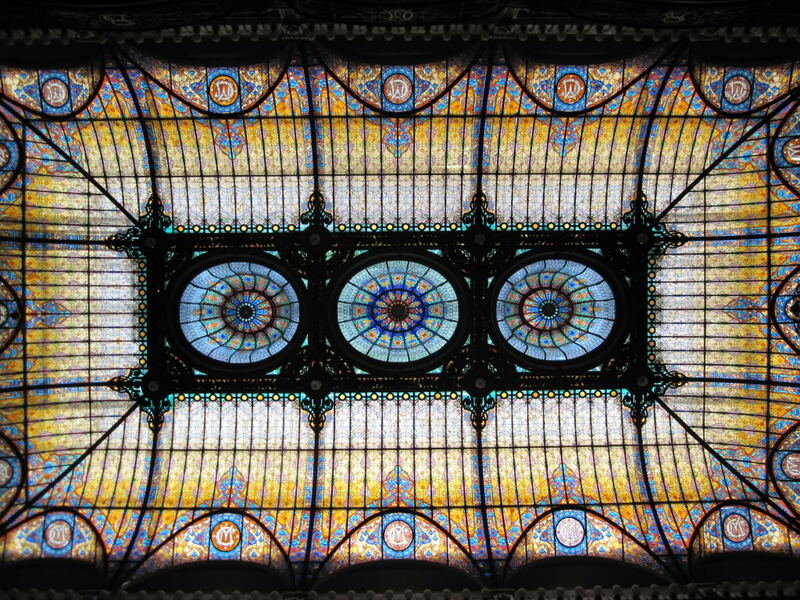 This glass ceiling belongs to the lobby of the Gran Hotel Ciudad de Mexico. The hotel was built as a department store in 1899, known as Mercantile Centre. It was the first building in Mexico to use iron and concrete in its construction. 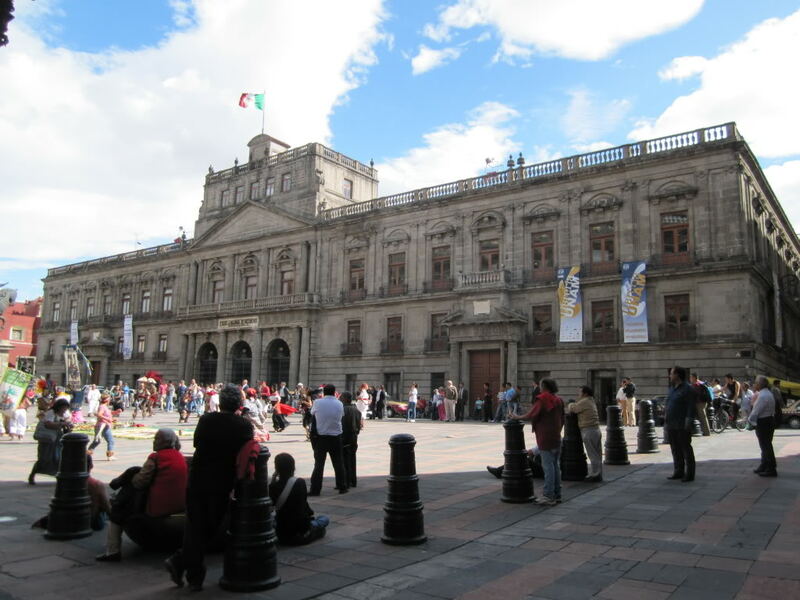 One of the facades faces the city's main square, the Zocalo, and follows a strict neo-colonial design. 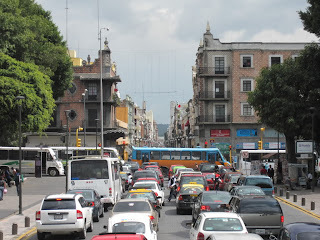 The main facade, however, faces a separate street: Calle 16 de Septiembre. Palacio de Correos and Torre Latino Americana: The Main Post office was inaugurated in 1907. The facade mixes Plateresque and Venetian Gothic motifs. The architect was Adamo Boari. Torre Latinoamericano was built in 1957, and used to be Mexico City's tallest building (183 m). 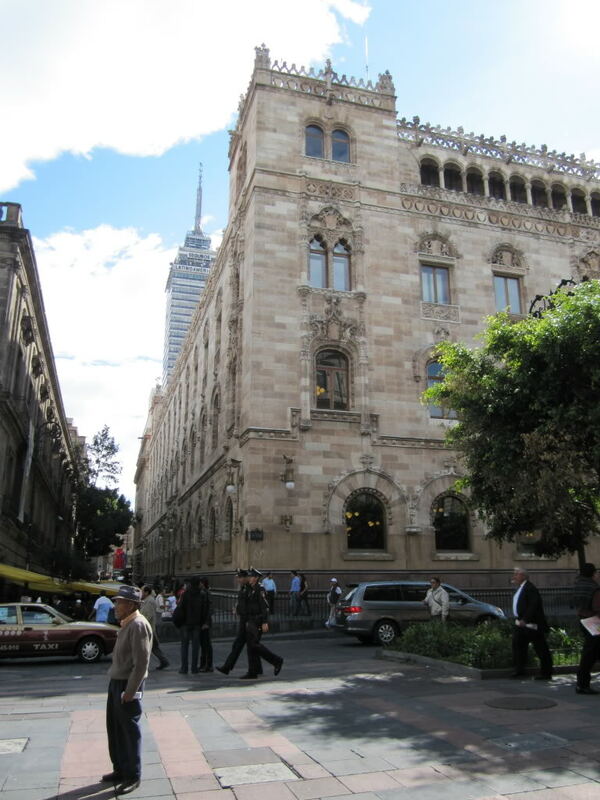 The two buildings on the southern side of the Zocalo are called the Federal District buildings. The building to the right was the site of the original city hall from 1532. The current building was built in 1724 and was remodelled for the centennial celebrations in 1910, but the work was only completed in 1930. The new building, on the left, was built between 1941 and 1948. Palacio Nacional: The National Palace measures 200 metres long and covers the whole eastern side of the Zocalo. It is the seat of the executive branch of the federal government. Some of the building material was reused from the previous Aztec palaces. 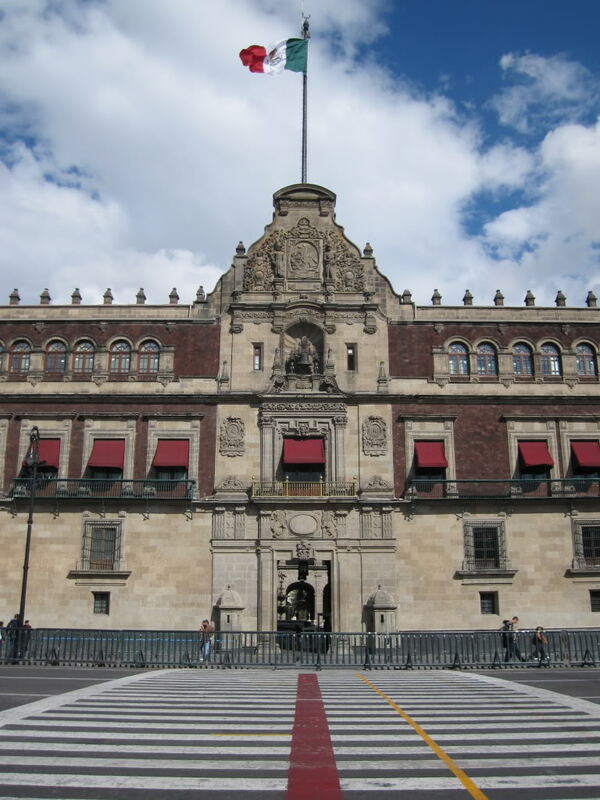 The fortress-like building erected by Hernan Cortez became the palace of the viceroys, but burned to the ground in 1692. 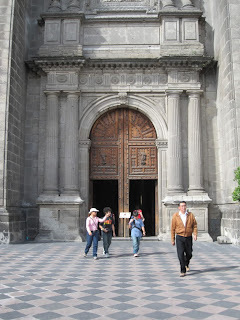 It was subsequently rebuilt with a baroque facade. Several changes have been made since, the top floor was added between 1926 and 1929. 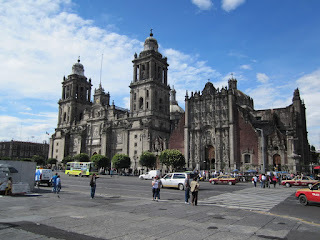 Catedral Metropolitana & Sagrario: The cathedral is built on top of parts of the demolished Aztec Templo Mayor. The original church was erected soon after the Spanish conquest, but the current church was begun in 1573 and only completed in 1813. The Sacristy or Metropolitan Tabernacle was built on the north side of the Zocalo, right next to the cathedral, between 1749 and 1760 by Lorenzo Rodriguez. 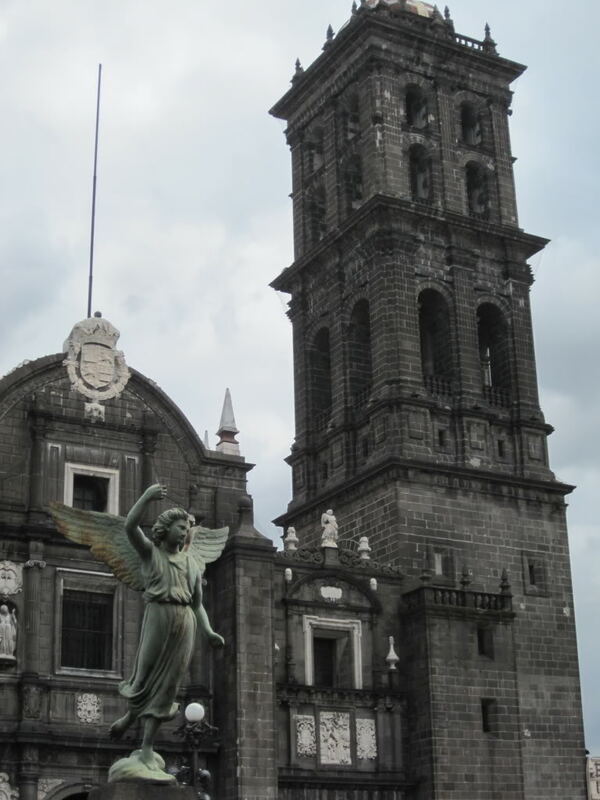 The last phase of the Cathedral's construction was carried out in neo-classical style by Manuel Tolsa. 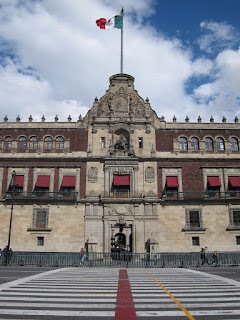 Palacio de Mineria: This building was built between 1797 and 1813, originally as headquarters for the mining industry in Mexico. 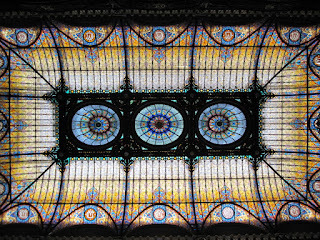 The architect was Manuel Tolsa. 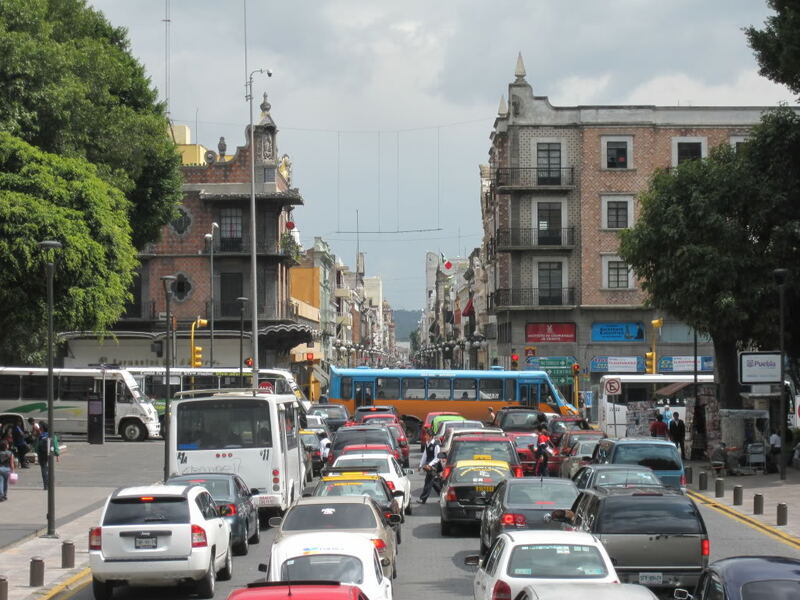 Glorieta de Colon: The monument to Columbus was erected in 1877. 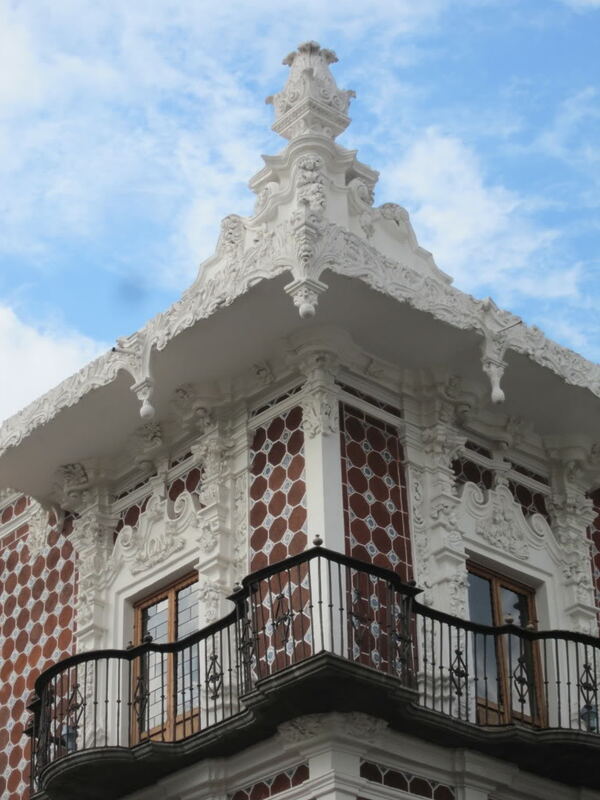 The historic centre is famous for the decoration of houses in 'Talavera' glazed tiles. 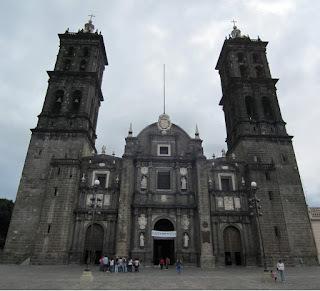 The cathedral is dedicated to the Immaculate Conception. Construction began in 1575 and the cathedral was completed in 1690. Works were interrupted between 1626 to 1640. 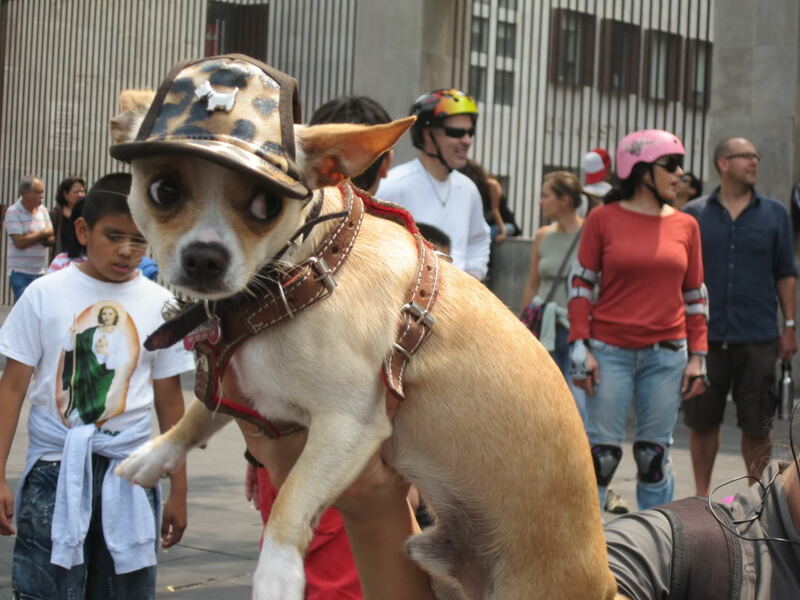 Francisco Becerra was originally the appointed architect. Juan Gómez de Trasmonte continued the work from 1640 onwards. 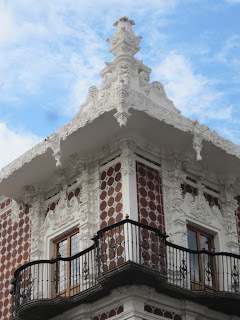 Casa de Alfeñique was built in 1791 by architect Antonio de Santa Maria Inchaurregui. The name indicates the sugarcandy-like decoration.